In 2018, more and more brands have started to develop YouTube influence marketing and achieved corresponding achievements. And YouTube’s six-digit number of channels has increased by more than 40% year-on-year. How do the small channels make money in 2019? NoxInfluencer will tell you how. What can NoxInfluencer bring to small channels? How do earn money on NoxInfluencer? The NoxInfluencer platform can track YouTube channel statistics and analytics, provide to influencers with YouTube’s analytics data, guide how to grow and increase subs, provide cooperation opportunities with Global Brands. What can NoxInfluencer bring to Influencers? Through the NoxInfluencer platform, you can view and analyze your subscriber growth trends, subscriber distribution countries, video viewing trends, and understand subscriber preferences to optimize video content channels and increase subscriber numbers. If you want to analyze your and other same levels of YouTube channels, you can use the influencer details page to understand. Of course, you can also analyze your subscriber type and subscriber source to recommend more things that subscribers like. Also, YouTube’s popular tags and keyword optimization are essential for small channels. 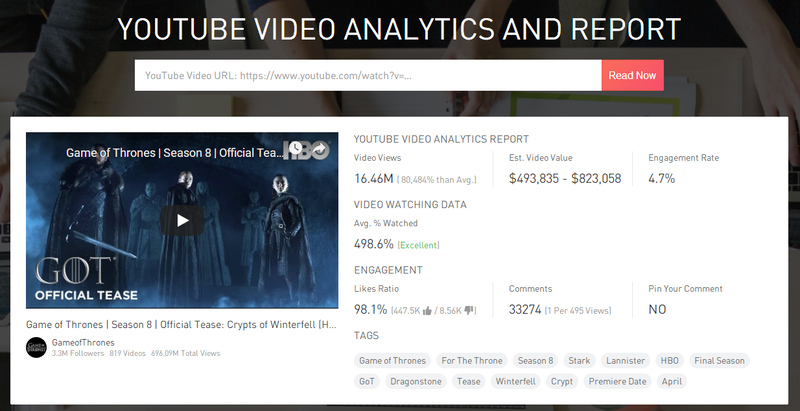 You can improve the ranking of videos by analyzing and let more subscribers discover your videos. These analysis tools on the NoxInfluencer platform may help the small/new authors. However, it may be overlooked by YouTube Stars, like PewDiePie, because he already knows how to rule his channel. Through resource integration and industry reputation, the NoxInfluencer platform has attracted tens of thousands of brand owners to join and had YouTube campaign requirements in beauty, clothing, electronics, games, sports and so on. Therefore, if influencers want to make money, they can find the right brand owner on the NoxInfluencer platform. The CPI (Cost Per Install) cooperation mode is a major attempt of the NoxInfluencer platform in the influencer marketing, aiming to allow each influencer to participate, and this cooperation method can quickly establish a cooperation mode with the brand owner and can shorten order settlement cycle. Free consulting. By joining the NoxInfluencer platform, all influencers can get the fastest, most current brand task demand requirement. NoxInfluencer will review all brand owners and their campaigns, and will not release to the NoxInfluencer platform until the brand’s campaign is valid. After the campaign completed, YouTube influencers can apply for payment. Besides, NoxInfluencer encrypts personal and private information to ensure the security of each YouTube influencer’s account information. Go to NoxInfluencer, register as an influencer on the platform. After filling in the relevant information, you can check the brand’s campaign information for free, or you can apply for a campaign from the brand owner. According to the NoxInfluencer analysis, more brand owners will choose influencer marketing in 2019, and the influencers will become more professional. In 2019, NoxInfluencer hopes to help more YouTube influencers realize their monetization through platform resources and technology.